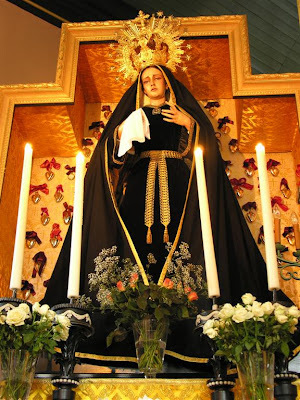 Brother Hugo points out that the custom is originally Spanish and that in Spain, the Madonna is traditionally dressed in black for the whole of November. Here is a link to various pictures of Maria Vestida de Luto. 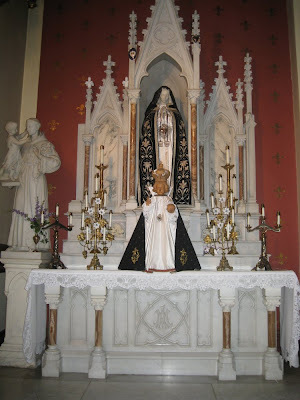 Mgr Stephen di Giovanni, the Pastor of St John the Evangelist Church in Stamford, Connecticut has sent me this picture of "Mama" (as Fr. Faber referred to her). She appears so each Good Friday, Our Lady of Sorrows and All Souls'. Mgr gratefully acknowledges the good influence of the London Oratory.